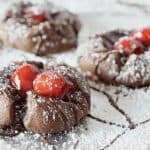 Cherry Chocolate Thumbprint Cookies are simple, yet decadent and even elegant holiday cookies that are so easy to put together that even a kid can make them. Or, in this case, even a Platter Talk Kid. 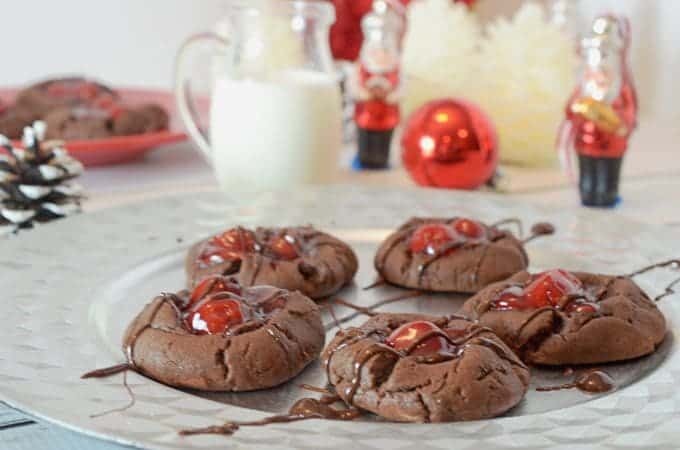 These holiday cookies are all chocolate, with a little cherry!. I’ve been yearning to put together some new holiday cookie recipes for a few weeks now. Anyone who knows anything about our modern family knows that we love a couple of things above all others: Our boys and our food. Whenever we get the chance, we love mixing the two together here on Platter Talk, in our kitchen, and once in a while at an eating establishment. There is perhaps no better time to bring kids (or other family/friends) into the kitchen, than over the holiday season. Most of us with kids live very busy lives. The kitchen is one of the best places we can think of where parents and kids can spend some truly quality time together. All you need are a few ingredients. And maybe a little patience. Holidays = Food = Family = Love = Fun. Or something like that. We live a busy life, in all likelihood just like you. If you’re really lucky, you have a hobby or past time that you really enjoy. We are two working parents with half a baseball team worth of kids, For us, one of those “side pleasures” involves food. Preparing it, sharing it, and teaching our kids about it, perhaps it’s a family tradition. We love spending time in the kitchen with our kids, especially during the holiday season. As this post that features Scott and his mom shows, it seems that indeed, the apple doesn’t fall far from the tree. 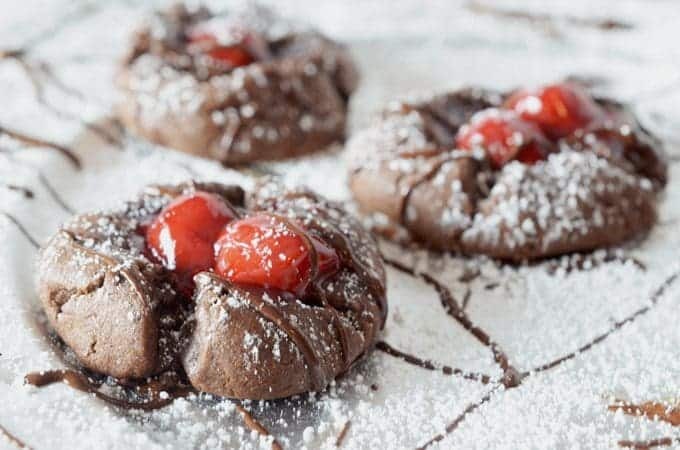 This recipe for Cherry Chocolate Thumbprint Cookies comes from another part of our family, our foodie family. Over the past few years, we’ve joined kitchens with some other food bloggers and it has been a great experience on many levels. We have gotten to know many talented folks and like our family at home, they have a great passion for food. That’s where this recipe comes into play. Every few months or so, a few of us “virtual foodie friends” get together and recreate a recipe from someone within our group. This month, we had the privilege of being paired with a couple of super-moms who also happen to run a stellar food website on the side. Their site is aptly named Who Needs a Cape? and clearly, they do very well without any such thing. Our task was to recreate a recipe from their site and with a little rearrangement of words, we chose their Chocolate Cherry Thumbprint Cookies. 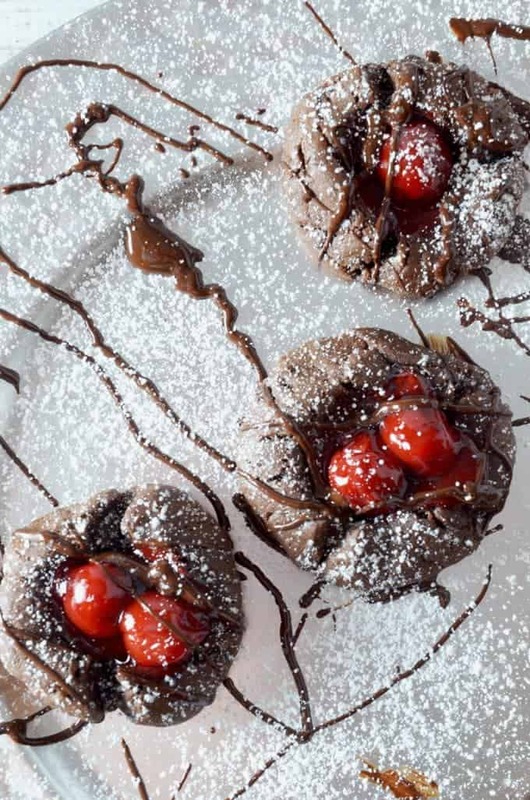 These chocolate and cherry beauties are crowned with a thing slather of melted chocolate. It never ceases to amaze me how food brings people together and now thanks to the digital world in which we live, this phenomenon occurs, even virtually. These cookies that came from friends we have never even met are a perfect example of the point I’m trying to make. If kitchen creations can have this effect on people who have never met in person, just imagine the experiences that can be created in your own kitchen with those you love. 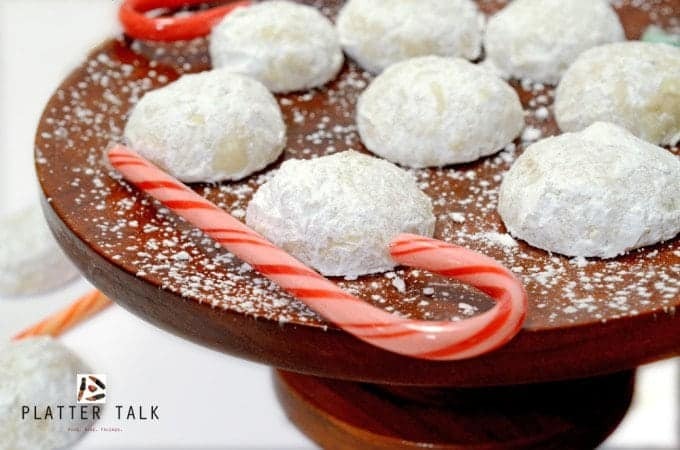 Try this wonderful treat this holiday season and find out exactly what we mean. Experience the magic of time in the kitchen this holiday season. In large mixing bowl, cream butter, sugar, eggs and vanilla. Add flour, cocoa, baking powder, baking soda, and salt. Mix thoroughly. Roll cookie dough into balls, 2 inches in diameter. Place on greased cookie sheet, lined with parchment paper and flatten slightly. Use thumb to create center well and place 2 or 3 cherries in thumbprint. Place in oven and bake for 15 minutes and then cool on wire wrack. Garnish with melted chocolate chips and then serve with cold milk. Don’t miss our virtual cookie exchange! Check out all of the great holiday cookies recipes shown below. These look so delicious! 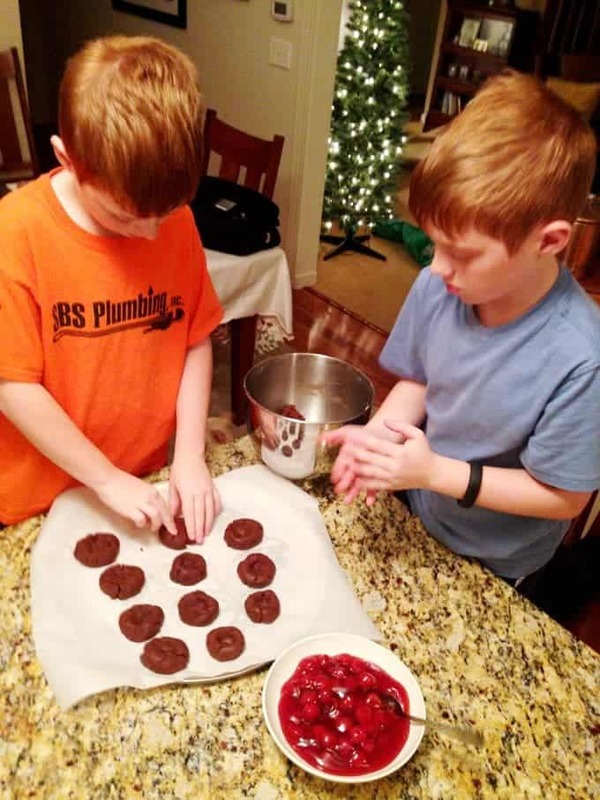 And I love love love the idea of involving kids in the kitchen, especially during holidays! So many of my childhood memories were in the kitchen or with food! Cherries & chocolate are a great combo! Love this recipe! What a great recipe – love the adorable video, too! My bestie LOVES cherry + chocolate together so I might have to make these when she comes to visit next month! YUM! I just love thumbprint cookies and these look perfect! 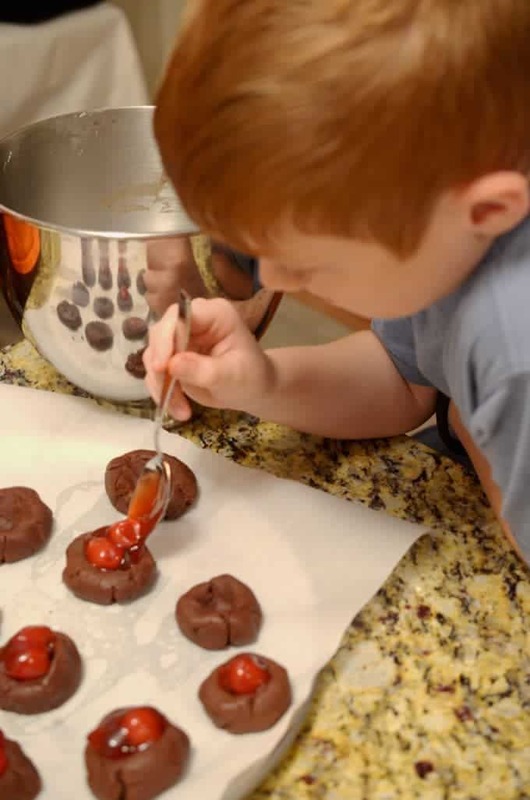 I’ve never tried cherry chocolate ones before; what a great way to get the kids involved too! What a beautiful combination of colors in these cookies! Who needs the stuffy dishes in Christmas parties? I just need the simple dishes with those my family can undergo a happy period of time to cook together. My children mostly don’t like cooking as me! But I think chocolate and cherry are favorite of them, and cookies are easy to make. So they likely love making them by theirselves. We can easily bake and enjoy them! Can’t wait to try them in this Christmas party. Thanks! Wishing you and your family a wonderful Christmas! Thanks, Emily. Happy holidays to you and yours! I should bake these with my boys. They will have a blast. Used to make very similar thumbprint cookies when I was young with my mom and brother. Brings back great memories and this recipe looks absolutely delicious! These are perfect to get the kids helping in the kitchen. The look awesome. Nice video too. Love that the kids are so into it! I love how made these beautiful cookies with your kids! So cute. Oh and the cookies look mouth-watering! Love the video. What a great little chef you have there. The cookies look great too. These look SUPER fantastic!! Yummy! Printing this recipe now! Thanks for posting it! These cookies are just perfect for the festive season! cherries and chocolate – what could be more delicious! These cookies look absolutely delicious! But, what’s even more delightful, is that video of y’alls boys! What a legacy y’all have passed on! Thanks, Shashi. We love doing just about everything with our kids; especially when it comes to making delicious food! This looks like a wonderful recipe to make for the family and to give as gifts to friends. I love the addition of cherries. Yum! Thanks, Julie. these do indeed make great holiday gifts! They’re absolutely gorgeous, and I love that the kids can help. Cherries and chocolate for the win! These thumbprint cookies look incredible and it’s so great to see the PT kids at work! Such a cute video for such a delicious decadent cookie! I love thumbprints, but never thought to make them with cherries. So fun that the kiddos help with this! I love getting the kids involved especially during the holidays. Your recipe looks so simple and so much fun with the kids. Love these festive cookies. The cherries are like Rudolph’s nose! Thanks so much, Claire, for your in-depth and meaningful comments; always so appreciated! How lovely! Yes, I agree on how the internet can bring people together! These cookies look great for the holidays!